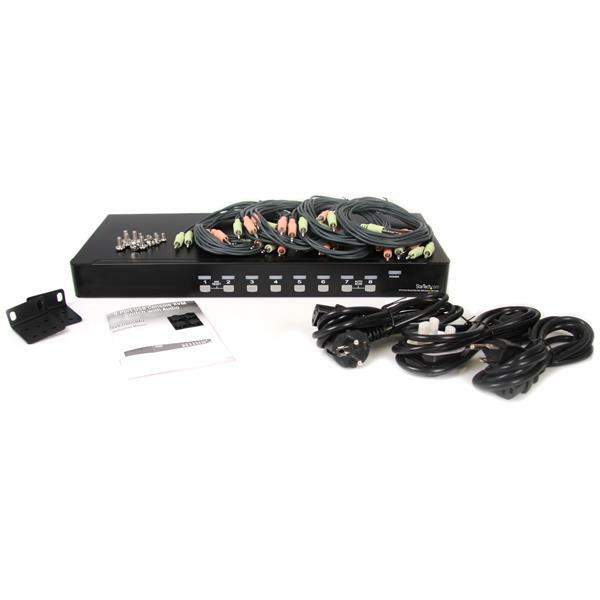 The SV831DUSBAU 8 Port Rack Mount USB VGA KVM Switch (with Audio Cables Included) allows you to control up to 8 USB computers using a single keyboard, mouse and monitor, and features Audio and Microphone ports to switch between audio signals as well as PC ports. 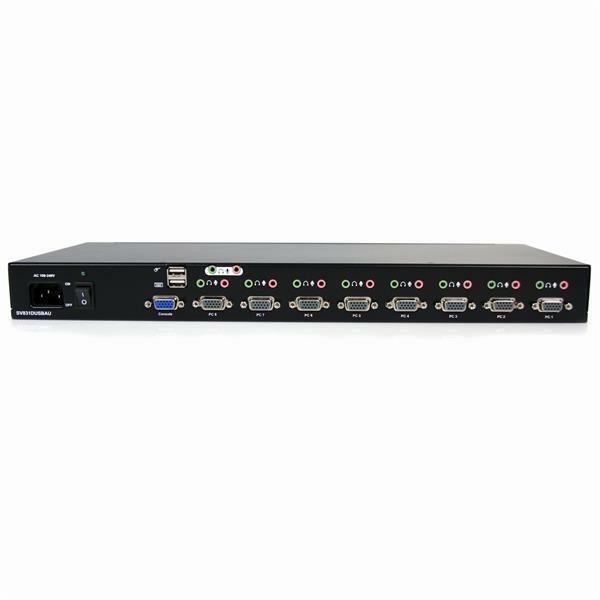 Based on a 1U rack mountable slim form factor design, this 8 Port USB KVM uses rear cable connections to maximize space efficiency. Multiple KVM units can also be connected (cascaded) together for control of up to 64 computers, ensuring a scalable KVM solution that can be expanded as necessary. To ensure seamless operation, the switch features automatic and manual scan modes, supports both hot-key and front panel push-button switching, and features a convenient OSD (on-screen display) for added configuration options. This product is TAA compliant and backed by a Startech.com 3-year warranty with free lifetime technical support. Note Package includes eight 6ft. green audio cables and eight 6ft. red microphone cables. Other lengths and options are available on the accessories page. What is a KVM switch, and how can I tell if it will work in my setup? KVM stands for Keyboard Video Mouse and KVM switches allow you to switch the use of a keyboard, display and mouse between multiple computers. KVM switches also commonly let you switch audio and USB devices between computers. There are different types of KVM switches as well. Standard box and cable KVM switches are a simple way to switch the use of a keyboard, display, and mouse between multiple computers. 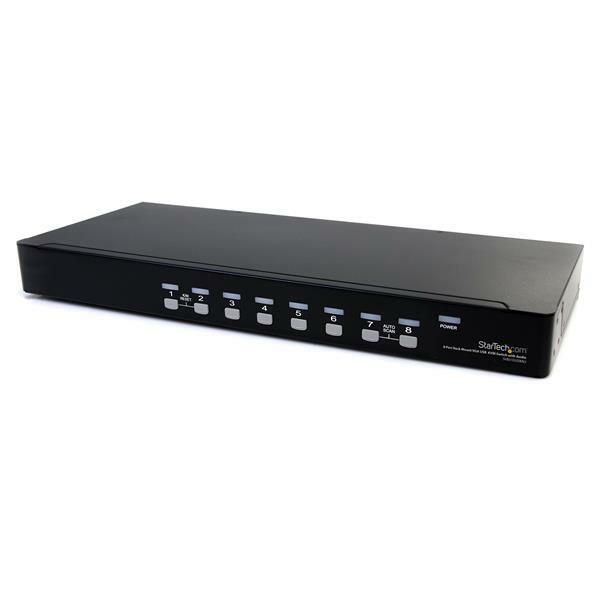 Multi-monitor KVM switches allow you to switch multiple displays between computers, and IP KVM switches allow you to remotely control the KVM switch and connected computers over a network. Here are some important things to consider before purchasing a KVM switch. How many computers do you need to control? 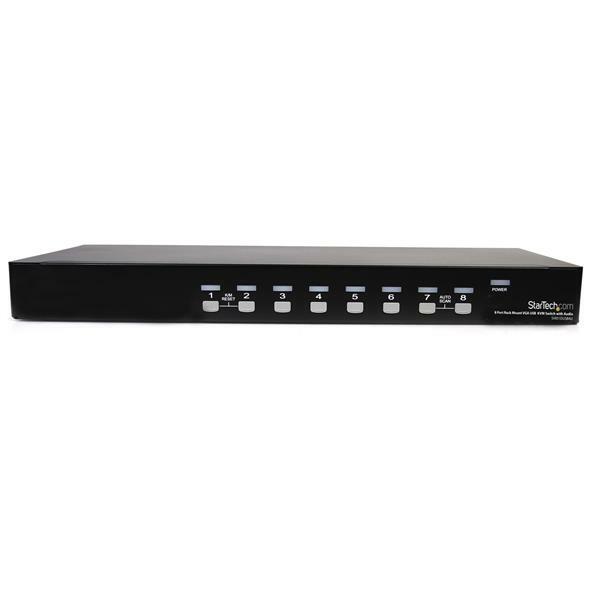 Purchase a KVM switch that supports the number of computers in your setup. Which video connections do your computers and display(s) support? It is best practice to use the same video connections wherever possible. Will you be using a PS/2 or USB mouse and keyboard? Do you need multiple monitor support? Ensure every computer can support the number of monitors you are looking to use in your setup. Do you need audio support? What resolution(s) do you want your display(s) running at? The KVM switch must support the resolution(s) you want to use. Would you like hotkey support? Some KVM switches support the use of hotkey combinations to complete tasks such as switching between computers. Some KVM switches require proprietary cables to function. These KVM cables may vary by each KVM switch. For StarTech.com KVM switches that require proprietary cables, the KVM switches will either come with these cables, or they will be listed in the Accessories tab on the individual product pages. For more information, see our video dedicated to KVM switch cables. Basic mice and keyboards are recommended for use with KVM switches. Wireless, gaming or combo mice and keyboards (mice and keyboards that use a single USB connection / receiver for both units) can cause performance issues, and in general, are not supported for use with KVM switches. What do I need to know about KVM switch cables? It can be difficult to tell which ones are right for the KVM switch you are interested in. How can you tell which KVM cables you require? How can you tell if a KVM switch requires proprietary cables? How do these cables work? Note: You will need one bundle of KVM cables per computer you want to connect to the KVM switch. Standard KVM switches have no special cable requirements. If you have spare video and PS/2 or USB cables, you can use them to hook up the KVM switch to your computers. StarTech.com still sells KVM cable packages, but they are just for the convenience of buying them in bundles and usually involve some savings. Keep in mind that even if you have some of the cables you need, it still might be advantageous to buy the bundle. Some KVM switches use male video connections for the computers and female video connections for the console ports. In this case you simply need a video extension cable, or a KVM cable package appropriate to the KVM switch. This is so you cannot accidentally plug cables from your computer into the console ports. KVM switches can also use proprietary KVM cables to connect to the individual computers. This is often done with larger KVM switches and KVM switches intended for a server environment. These cables use a proprietary pinout which does not conform to the video standard in use, as the cable carries both the video and PS/2 or USB data along a single cable. Check the Technical Specifications tab on the individual product pages for What's in the Box. This section lists everything that comes with your purchase, and your KVM switch might come with the cables. Check the Accessories tab. This section lists potential accessories for the product you are looking at. StarTech.com will list the appropriate KVM cables for the KVM switch here. 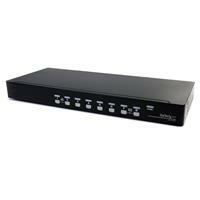 Check the Gallery and look at a picture of the back of the KVM switch. Note: If there are no PS/2 or USB ports on the back of the KVM switch other than for the console, you will require proprietary cables. If at this point you require further assistance in deciding which cables to purchase with your StarTech.com KVM switch, contact our technical support team. Will my mouse and keyboard work with this KVM switch? Whether a specific mouse or keyboard will work with StarTech.com KVM switches can depend on the type of mouse or keyboard you use. Any mice with additional functionality or keyboards that are not standard 104 key keyboards could cause issues. This includes wireless, gaming, combination (one USB receiver for both the mouse and keyboard), and Apple keyboards. We recommend that you use a standard wired mouse and keyboard with our KVM switches, especially when you troubleshoot issues. If you cannot get a specific mouse or keyboard to work with your KVM switch, connect the mouse or keyboard into the USB hub ports, if available (they are marked on the back of the KVM switch). If the KVM switch has hotkey functionality, you will lose the functionality when using these hub ports. How do I set up my KVM switch? Turn off all of the computers and monitors that will be connected to the KVM switch. Connect the power adapter to the KVM switch. Connect the video cables from your monitors to the console video port on the KVM switch. Connect your keyboard and mouse to the console PS/2 or USB ports on the KVM switch. If you have not done so already, change the KVM switch to focus on port 1. Connect the video cables from PC1 to the KVM switch. Connect the PS/2 or USB cables from PC1 to the PC1 PS/2 or USB ports on the KVM switch. Turn on PC1. You should see the computer load the operating system that you are using on PC1. Make sure that the mouse and keyboard can control PC1. Repeat steps 4 to 8 for each additional computer that you want to connect to the KVM switch. Leave the computer in focus until you make sure that the mouse and keyboard can control the computer in step 8. Certain KVM ports or computers are working but not all of them. What do I do? There are four troubleshooting actions that you can try if some but not all of the ports and your computer are working with the KVM switch. To determine if a specific cable is the source of the problem, switch the cables that connect the KVM switch to the computers to one working port and computer, and one port and computer that is not working. Keep the computer plugged into the same ports and only switch the cables. If the issue persists when you switch cables, the issue may be with the cable itself. To determine if the problem is between the computer and the KVM switch, using the same cables, connect the KVM switch to one computer that is working and one computer that is not working. If the issue persists when you switch computers, follows the issue may be with the computer and the KVM switch. Try reinitializing the KVM. This is done by following the setup instructions on the website. To determine if the KVM switch is the source of the problem, if you have another KVM switch, disconnect the current KVM switch and connect the second KVM switch. My keyboard keeps repeating keys when it is plugged into the KVM. What do I do? If the KVM you are using has USB ports, you can move your keyboard to the USB hub port on the back of the KVM (the USB hubs are marked). Note: When you move the keyboard out of the keyboard port, you will not be able to access the hotkeys. Click Control Panel > Keyboard > Speed. Adjust the repeat delay and repeat rate until the keys no longer repeat. Click Control Panel > Hardware and Sound > Devices and Printers. Right-click Keyboard Settings. Adjust the repeat delay and repeat rate until the keys no longer repeat.